A well-designed, reliable and scalable CAT6 structured cabling system or fibre infrastructure for your data and voice applications are crucial to achieve the very best from your IT systems. We are here to help you do this by providing your business with a well-designed and excellently-structured installation to your cabling systems to suit your current level of network traffic, with expandability to cater for future growth. CyTechnology’s experts specialise in integrating voice and data cabling infrastructures to deliver improved efficiency and a solid, profitable return on investment and service. Contact us to enquire about our structured cabling health check for any of your existing network requirements including testing, repair or replacement. This is the backbone of your network. It creates the hub for communication across your entire network piecing all aspects of your business together. Cat 5e, Cat 6 Data cabling and fibre optics. 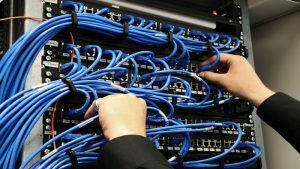 Of older obscure structured cabling systems. Designing and installation of infrastructures to suit your current level of network traffic with scalability to cater for future growth with fibre optic cabling. Integrating voice and data cabling infrastructure for improved efficiency and a profitable return on investment. Contact us for more information on how we can provide you with cabling solutions.